Street art. 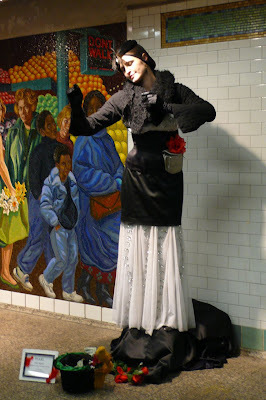 Dashing through Grand Central, I was stopped by the sight of this elegant mime striking enchanting poses on a black silk pedestal. Pearl the Mime, said a card by her hat. Naturally, she's got a myspace page. Where she's listed as being 101 years old and skilled in roving improvisation, silent story telling, and living statue. In case you have an opening in any of those areas.